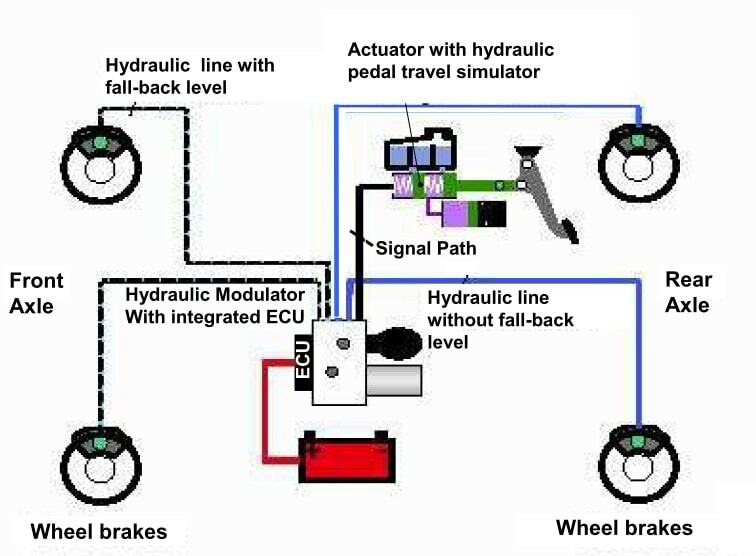 The brakes or the system of braking mechanism which are operated and applied by liquid or oil pressure from controlling mechanism to braking mechanism in order to slow down or completely stop the vehicle is known as hydraulic brakes. In simple language, hydraulic brakes are brakes which uses oil pressure for braking action. 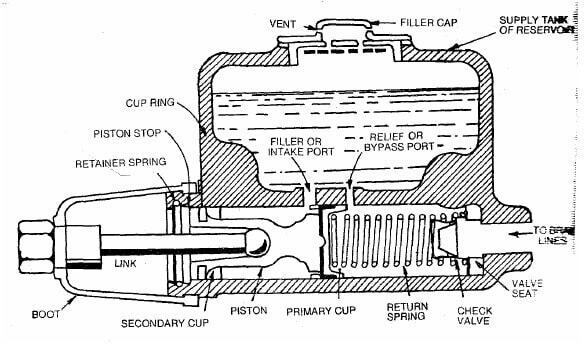 The master cylinder, also known as the master brake cylinder, converts the pressure on the brake pedal to hydraulic pressure by feeding brake fluid into the brake circuit and controlling this according to the mechanical force. Disc and drum brakes, both uses master cylinder. Brake lines are tubes that carry fluid between brake components. Brakes translate the pressure from your foot on the brake pedal into stopping power. The brake pedal is the pedal that you press with your foot in order to make a vehicle go slower or stop accordingly with respect to the force applied to the brake pedal. Different types of brakes (Disc and drum) that slows down the vehicle by the pressure of oil or fluid/ by generating hydraulic pressure directly applied to the wheel brakes. It is a different cylinder than the master cylinder. It is the cylinder of wheel. Located in each wheel. Its function is to exert force onto the shoes so as to bring them into contact with the drum and stop the vehicle with friction. The common brake fluids which are used for the hydraulic brakes are DOT3, DOT4, DOT5,etc. For instance, DOT3 DOT4 and DOT5 are glycol ether based which generally means that they absorb moisture from the atmosphere. However, the hydraulic brakes are applied by the liquid pressure. The pedal force is transmitted to the brake shoe by means of a confined liquid through a system of force transmission. The force applied to the pedal is multiplied and transmitted to all the brake shoes by a force transmission system. This system is based upon Pascal’s principle, which states that “the confined liquids transmits pressure without loss equally in all directions”. Essentially there are two main components, master cylinder and wheel cylinder. The master cylinder is connected by tubing to the wheel cylinders at each wheels. The system is filled with the light pressure when the brakes are not in operation. However, the liquid is known as brake fluid. Each wheel brake consists of a cylinder brake drum which is mounted on the inner side of the wheel and revolves with it and two brake shoes which are mounted inside the brake drums and do not rotate. The shoes are fitted with a heat and wear resisting brake lining on their surfaces. The brake pedal is connected to the master cylinder piston by means of a piston rod. When the brakes are applied or when the brake pedal is pressed, the piston is forced into the master cylinder, which increases the pressure of the fluid in the master cylinder and in the entire hydraulic system. This pressure is conducted instantaneously to the wheel cylinders on each of the four brakes, where it forces the wheel cylinder pistons outwards. These pistons, in turn, force the brake shoes out against the brake drums. Hence, brakes are applied. When the brake pedal is released, the master cylinder piston returns to its original position due to the return spring pressure, and thus the fluid pressure in the entire system drops to its original low value, which allows retracting springs on wheel brakes to pull the brake shoes out of contact with the brake drums into their original positions. This causes the wheel cylinder pistons also come back to their original inward position. Thus, the brakes are released. Hence, operation of hydraulic brakes is completed. Automobiles. Widely used in cars. They transmit uniform pressure. (Due to hydro static pressure being equal in all directions, Pascal law). They help in multiplying the driver’s effort more times than that of Mechanical Brakes. (Hydraulic leverage ratio, hydraulic advantage). Higher mechanical advantage. The brake fluid also acts as lubricant and reduce the frictional losses at high-speed braking. They are simpler in construction and lighter in weight. Thermal stresses generated are much lower in hydraulic brakes than Mechanical Brakes. However, they are more wear resistant. There is always a possibility of oil/fluid leakage which can render the system inoperative or compromise the friction surfaces. Extreme heat may cause the fluid to boil forming gas bubbles which compress and can’t transmit pressure effectively. However, Environmental factors such as moisture can deteriorate the hydraulic fluid over time and cause corrosion/failure of internal components.